With support from the Forest Legacy Program of the USDA Forest Service, the New Hampshire Division of Forests and Lands is achieving goals outlined in its Forest Action Plan. Working in close collaboration with numerous partners, the Androscoggin Headwaters project is the state’s third largest conservation project, protecting more than 31,000 acres of forestland in large part (22,957 acres) through a conservation easement. The economy of Northern New Hampshire was anchored for generations by the pulp and paper industry until 2006 when the historic mill in Berlin closed permanently. As part of the decline of the pulp mill, hundreds of thousands of acres were divested and parceled out to new owners creating instability for the region’s forest and recreational economy, and uncertainty for residents. These new timberland owners were looking for a return on their investment, which meant that some of the most attractive development parcels around ponds and mountain views were newly threatened. It also meant that there were new opportunities for conservation, where land trusts and public agencies identified thousands of acres that were desirable for protection due to their recreation value, wildlife habitat, and scenic beauty. In 2009, the Trust for Public Land began working with the Plum Creek Timber Company to develop a conservation strategy for the 31,300 acres Plum Creek owned next to the Umbagog National Wildlife Refuge and the Androscoggin River. The Androscoggin Headwaters Project aimed to conserve the most important wildlife habitat through fee purchase and conveyance to the US Fish and Wildlife Service or New Hampshire Department of Fish and Game. The balance of the lands would be conserved with a working forest conservation easement held by the New Hampshire Department of Resources and Economic Development and funded by the USDA Forest Service Forest Legacy Program (FLP). This project required buy in from numerous agencies, stakeholders, and the political leadership of the state. At over 31,000 acres, this was the third largest conservation project in the state’s history and it required a multi-year investment from over a dozen funders to secure over $17 million. This Androscoggin Headwaters Project was consummated in a 5-phase project structure that unfolded between 2010 and 2014. In Phases I and II, the Umbagog Refuge acquired 7,455 acres. In Phases III and IV, the State of New Hampshire acquired easements on 22,957 acres using $7.319 million in FLP funds. Finally, in Phase V, the New Hampshire Department of Fish and Game acquired 934 acres around the Greenough Ponds, two of three self-sustaining wild brook trout ponds in New Hampshire. At the end of the project, 27% of the property was purchased in fee. The remaining 73% will stay a private commercial forest and the conservation easement guarantees that harvesting will be done sustainably and take into account recreational and wildlife values. All of the property remains open to public access for recreational activities. The Androscoggin Headwaters Project remains a highlight of New Hampshire land conservation efforts and a model of state government, federal government, non-profits, and industry working together to ensure the right balance between commercial forestry and wildlife conservation. With support from the Forest Legacy Program of the USDA Forest Service, the Idaho Department of Lands is achieving goals outlined in its Forest Action Plan. In late 2014, the Idaho Department of Lands (IDL), in partnership with the Trust for Public Land, acquired a conservation easement on 6,800 acres of working forest within northern Idaho’s McArthur Lake Wildlife Corridor (MLWC). With funding from the USDA Forest Service Forest Legacy Program, IDL purchased the $5.695 million conservation easement for a discounted price of $4.095 million. The landowner, Stimson Lumber Company, generously contributed the difference. Stimson will continue to manage this land under an easement restricting development and subdivision, ensuring that the land will forever remain in active timber production while protecting wildlife habitat and providing free public recreation. Idaho’s Forest Action Plan identifies the forests within the McArthur Lake area as very high priority for benefiting forest products markets. Ten commercial mills are located within a 2-hour haul distance from project lands, underscoring the value of forest products as a source of jobs and revenue. The easement property contains highly productive forests capable of supplying 2.5 MMBF of merchantable timber annually. MLWC connects the Selkirk and Cabinet-Yaak Mountains and is recognized as one of the most important wildlife linkage zones in the region and a conservation area of national significance. The large expanse of intact forest provides exceptional habitat and connectivity for numerous wide-ranging wildlife species including elk, mule deer, moose, white-tailed deer, black bear, gray wolf, wolverine and five threatened and endangered species. The acquisition of this conservation easement is only one piece of landscape-scale forest conservation within the corridor. Two additional projects were initiated by The Nature Conservancy. In 2010, IDL purchased an adjacent 3,900-acre FLP conservation easement with USFS funding. By the end of 2015, a third FLP project will secure an 8,000-acre conservation easement within MLWC. In partnership with the USFS and conservation organizations, Idaho’s Forest Legacy Program ensures that 19,000 acres of working forestland within MLWC continues to support the economy, provide habitat for the region’s iconic wildlife species, and is available to the public for recreation. Most importantly, landowners have endowed the citizens of Idaho with assurance that the forests we depend on will forever benefit all Idahoans. With support from the USDA Forest Service’s Urban and Community Forestry program, the Wyoming State Forestry Division is achieving goals outlined in its Forest Action Plan. Through a partnership with the Montana Department of Natural Resources, the Wyoming State Forestry Division established The Northern Rockies Tree School (NRTS). NRTS offers a community forestry workshop dedicated to teaching the latest in tree care practices in order to protect the region’s clean air and water, wildlife habitat, recreational opportunities and economic benefit derived from trees. The annual workshop location alternates between northern Wyoming and southern Montana and provides an average of 130 professionals (representing municipalities, extension agents, conservation districts, state governments, tree care businesses, school districts/colleges, tree boards, counties and consulting firms) a venue to learn and share experiences with their colleagues. Valuable camaraderie has been built between the two state forestry agencies and in turn has grown to reach other parts of the United States. Workshop speakers hail from a variety of backgrounds including university research, private consultants, invasive pest management and utility arboriculture. In addition to the classes, the workshop offers several field sessions. In FY2014 the outdoor sessions focused on nursery stock evaluation, species selection, tree risk assessment, and GIS-based tree inventory mapping. “Growing trees in the Rockies can be challenging; it’s nice to see this group coming together for the common good of urban and community forestry,” said Bill Crapser, State Forester. An International Society of Arboriculture (ISA) Arborist Certification exam is offered as well as continuing certification units (CEUs) for current certified arborists. Those that are not yet certified are given the opportunity to learn more about the importance of professional certification. Over a dozen sponsors provide financial reports and represent their companies with educational booths. With support from the Urban and Community Forestry program of the USDA Forest Service, the Department of Conservation and Recreation, Bureau of Forestry and Fire is achieving goals outlined in Massachusetts’ Forest Action Plan. The Greening the Gateway Cities Program (GGC) is a partnership among four Massachusetts’ agencies: the Executive Office of Energy and Environmental Affairs (EEA), the Department of Conservation and Recreation (DCR), the Department of Energy Resources (DOER), and the Department of Housing and Community Development (DHCD). Launched in January 2014, the pilot project aimed to reduce household heating and cooling costs by increasing the canopy cover by 10% in three (Chelsea, Fall River, Holyoke) of the state’s Gateway Cities. To reach this goal, it was estimated that a total of 15,000 trees would need to be planted on both public and private property with the aim of planting the majority of trees on private property where the greatest available planting area exists in urban areas. In late spring of 2014, all three pilot cities received street trees to plant in the public right of way. “Planting trees in urban areas is critical not only for the health of the city but most especially for the positive benefits that trees provide to the people that live and work in those communities,” said Peter Church, State Forester. Due to the location of current DCR resources and the readiness level of partner cities, Chelsea was also selected to receive trees to plant on private property, planted by DCR crews comprised of local labor and led by DCR Foresters. The DCR field crew coordinated with a local non-profit, The Chelsea Collaborative, to conduct outreach and door to door canvassing. EEA secured U.S. Forest Service funding to help our non-profit partners to assist with outreach for private property tree plantings. Our other non-profit partners are Nuestras Raices in Holyoke and Fall River Street Tree Planting Program. At the conclusion of the spring planting season, 476 trees were planted on both public and private property in all three cities at a cost of $380 per tree and a review of the program was conducted to work out logistics and to determine solutions to increase the scale of the project. The project scale was increased for the fall 2014 planting season. A DCR tree planting crew was added in Chelsea and one was created for Holyoke to not only assist the municipalities with public tree plantings but to plant trees on private property that our non-profit partners helped to identify. It is anticipated that the GGC will continue to grow each season and will provide similar success in other Gateway Cities. With support from the USDA Forest Service Cooperative Forestry, California is achieving goals outlined in its Forest Action Plan. The USDA Forest Service’s Forest Stewardship and Forest Health Management Programs, in combination with California’s Forest Improvement Program, are providing valuable technical assistance to California forestland owners for stewardship planning, timber stand improvement, forest rehabilitation, reforestation, and fuels reduction. The funding allowed many landowners to work with California Registered Professional Foresters to develop stewardship plans and participate in the Greenhouse Gas Reduction Fund (GGRF) program. The GGRF provides significant funding for incentives to reforest and or reduce fuels on forestlands. In fiscal year 2014, 11,320 acres were incorporated into forest management plans. The USDA-CAL FIRE programs also supported the Forest Landowner Stewardship Curriculum, a quarterly newsletter for forestland owners that reaches more than 7,000 readers, and the toll-free HELPLINE, which allows residents to call and talk to professional foresters about tree health, harvest, and policies. With support from the USDA Forest Service, the Kentucky Division of Forestry (KDF) is achieving goals outlined in its Forest Action Plan. In conjunction with local partners and a USDA Forest Service Landscape Scale Restoration grant, KDF and the Virginia Department of Forestry helped six communities in the southeastern Appalachian corridor developed plans to create green spaces. The purpose of the grant was to expand community planning and long-term strategies to conserve, enhance, and protect community natural resources and encourage forest based recreation and eco-tourism. The project recognized that communities in the region hold rich natural resources like coal, yet often lack a cohesive strategy to conserve, enhance, and fully utilize them. KDF partnered with Virginia Tech’s Community Design Assistance Center (CDAC) to select communities to work with. Upon selection, a meeting was held in each community where various stakeholders gathered to discuss their vision for the green space projects. Once soil samples and maps were collected at each community, the CDAC presented at least two conceptual design plans to each of the six communities. After the designs were explained and presented, citizens were able to give their opinion on specific details of the plans that they liked, didn’t like, or had ideas for other options. “The fact that the communities have been so successful in leveraging grant funding to implement these plans demonstrates the true success of bringing a community together to address issues and envision a future for their natural resources,” said Leah MacSwords, State Forester. All of these communities are implementing at least one piece of their plan. The planning process that CDAC led is paying off, not only in dollars secured for projects, but in bringing communities together as a whole. With support from the USDA Forest Service, the Oregon Department of Forestry (ODF) is achieving goals outlined in its Forest Action Plan. With a Chiefs’ Joint Landscape Restoration Partnership grant, Oregon has turned the threat of wildfire into a chance for new collaboration. Led by ODF, an interagency team in the Blue Mountains of northeast Oregon and southwest Washington has used the Cohesive Wildfire Strategy framework to restore 70,000 acres (owned by more than 30 landowners) along the eastern face of the Blue Mountains. ODF is also administering a 200-acre timber harvest on Oregon Department of Fish and Wildlife lands, reducing fuels and improving fire resiliency. “We have a long history of working together on wildfires…That forms a great foundation for working together on restoring forest resiliency and reducing fuels, with the aim of treating larger landscapes,” said Mark Jacques, project coordinator with ODF. Across the boundary line, the Wallowa-Whitman National Forest leads a complementary project. Ramping up restoration requires new approaches to investment and collaboration. In a pioneering step, Oregon state government has invested $2.88 million in federal forest restoration, supplemented with federal funds. Some of the state dollars help support local collaborative groups, including one involved in planning the 46,000-acre East Face Restoration Project on the Wallowa-Whitman, which aligns fuels reduction and restoration work from the ridge top to the valley floor. Furthering the spirit of innovation, more than $170,000 in grants have helped local businesses, cities and other entities find uses for the smaller woody debris that flows from restoration projects. Robust markets for this biomass can help lower the cost of restoration and increase the acreage treated. With support from the USDA Forest Service State & Private Forestry competitive grant program, the New Mexico State Forestry Division is achieving goals outlined in its Forest Action Plan. The devastation experienced following a destructive wildfire can be felt long after the flames have died down and the fire crews have left the scene. New Mexico experienced this first hand in recent years following several large-scale damaging wildfires. For those affected by wildfire, there are many things to take into consideration before cleanup even begins. The ‘After Wildfire’ Guide developed by New Mexico State Forestry offers New Mexicans help navigating the often difficult process of rebuilding after a major wildfire. The guide has already become a model for other states. In addition to local assistance, the guide and website have been reproduced by other states such as Oregon and Idaho and federal agencies such as the National Park Service. Sections of ‘After Wildfire’ help users take specific actions that implement National Cohesive Wildland Fire Management Strategy goals for resilient landscapes, fire-adapted communities, and wildfire response. “This is the best website I have seen for post-fire recovery. It is an excellent resource that will help communities, home owners, and incident managers. I will recommend it to everyone that needs assistance after a wildfire,” said Richard Schwab, National Coordinator for Post-Fire Programs for the National Park Service. The idea for this project grew out of a direct request from communities that experienced destructive wildfires, including the Las Conchas and Little Bear Fires. In the aftermath of those events, people from the affected areas had to figure out how to find their way through a confusing array of programs that might or might not apply to their situation. In 2014, the team received a $40,000 grant to enhance and build on the guide from the US Army Corps of Engineers’ Institute for Water Resources through the NM Silver Jackets, an interagency group focused on flood issues. On-the-ground partners include the USDA Forest Service, United States Army Corps of Engineers, New Mexico State University, Natural Resources Conservation Service and New Mexico Association of Counties. With support from the USDA Forest Service’s State Fire Assistance program, the Florida Forest Service is achieving goals outlined in its Forest Action Plan. The Florida Forest Service oversees the most active prescribed fire program in the country. In 2014 for instance, the Florida Forest Service treated more than 2.5 million acres with prescribed fire to reduce hazardous fuels buildup and mitigate wildfire risk. Other benefits of prescribed fire include disease control in young pines, habitat improvement for wildlife, range management, and preservation of endangered plant and animal species such as the Pot-of-Gold and Catesby’s lilies, White Top Pitcher Plants and several species of rare orchids, including the Yellow Fringeless Orchid found on the Blackwater River State Forest. With support from the USDA Forest Service’s State Fire Assistance program, the Wisconsin Department of Natural Resources is achieving goals outlined in the state’s Forest Action Plan. Numerous debris burning-caused wildfires had been catching across Wisconsin, and even though the residents that started them had obtained proper permits, they weren’t properly extinguishing their fires. To change that the Wisconsin Department of Natural Resources, in partnership with the Great Lakes Forest Fire Compact (made up of five state and provincial agencies in the Great Lakes region), launched an ember awareness campaign. “The relationships that we have built among our partners within the Great Lakes Forest Fire Compact have allowed us to maximize our fire prevention efforts. The ember awareness campaign has been a great success for us here in Wisconsin,” said Paul DeLong, State Forester. In FY 2015, the effort will focus more on the protection from embers in the event a wildfire occurs and target seasonal homeowners located in fire prone areas. The goal is to encourage the public to take necessary steps to improve their cabin’s chances of survival, without firefighter intervention. The campaign was adopted among five great lakes agencies in Wisconsin, Minnesota, Michigan, Ontario, and Manitoba. The agencies have shared in the production costs on many of the educational materials, resulting in a more efficient use of resources. The 2016-2017 fire prevention effort will focus on fire weather awareness. With support from the USDA Forest Service’s Forest Health Protection program, the Alaska Division of Forestry is achieving goals outlined in its Forest Action Plan. The Alaska Association for Conservation Districts (districts are legal subdivisions of the Alaska Department of Natural Resources, authorized under Alaska State Statute Chapter 41.10, Soil and Water Conservation Law) used Forest Health Protection funding to run an invasive plant “mini-grant” program, substantially increasing the number of groups engaged in invasive plant projects around the state. In 2014, the Alaska Division of Forestry and its partners awarded $86,000 in grants to 12 organizations to expand the fight against invasive plants in Alaska. 100 miles of road and eight remote landing strips were surveyed in the Tyonek Tribal Conservation District, which up until 2014, had never been inventoried for invasive plants despite being a critical area for fish and wildlife habitat. TTCD is a large rural area, accessible only by boat or plane. There are few roads in the district. The district hired two techs, who inventoried the communities of Tyonek, Beluga, Alexander Creek and Skwentna, as well as scouting about 100 miles of road and 8 remote landing strips. Previously unknown infestations of high-ranking invasive plants were discovered, several in their early stages. In the community of Beluga, an infestation of orange hawkweed (Hieracium aurantiacum) is spreading from an airstrip, and in Alexander Creek an infestation of reed canary-grass (Phalaris arundinacea) was identified. TTCD developed maps of all infestations and submitted their survey data to the Alaska Exotic Plant Information Clearinghouse In addition, TTCD shared invasive plant information with community members at the Tyonek health fair. Their next step is to develop an invasive plant management plan for the district and pursue funding to begin eradication efforts. With support from the USDA Forest Service, Vermont’s Urban and Community Forestry and Forest Health programs are achieving goals outlined in the state’s Forest Action Plan. Hemlock woolly adelgid and elongate hemlock scale are forest pests causing major damage throughout the native range of eastern hemlock making their way into the forests of Vermont, New Hampshire, and Maine. Through a competitive grant, partner contributions, and volunteers, the three states were able to protect the productive capacity of hemlock in critical habitats, urban tree canopies, and timberlands. Vermont’s (VT) Urban and Community Forestry and Forest Health programs have been working with the University of Vermont Extension, the VT Agency of Agriculture, and the USDA to maintain a Forest Pest First Detector program. By the end of FY14, there were 147 trained volunteers in this program. In addition, relationships were developed with schools and colleges, conservation commissions, and other citizens concerned about forest health. In FY14, a total of 65 sites in 18 towns were surveyed to detect spread of hemlock woolly adelgid, with 34 volunteers participating in these surveys, reporting upwards of 187 volunteer hours. “Hemlock woolly adelgid doesn’t recognize state boundaries, so our fight to slow the spread shouldn’t either. Working with our partners in New Hampshire and Maine, we’ve engaged volunteer first detectors to help in our surveillance efforts,” said Steven Sinclair, State Forester. Regional collaboration was also key to the project’s success. The three states worked together to adapt available information to northern conditions and to implement uniform methods. One outcome in FY14 was drafting the pictorial guide “Managing Hemlock in Northern New England Forests Threatened by Hemlock Woolly Adelgid and Elongate Hemlock Scale”, drawing on resource managers in the three states for input and review. In FY14, Vermont worked with volunteers to install impact monitoring plots in five locations, and to monitor five winter mortality and three predator release sites. When added to data from 37 monitoring sites in the other two states, there will be meaningful information to help manage HWA in the colder parts of the infested area. The project also succeeded thanks to the coordinating role of the US Forest Service. The survey protocols, management practices, and bio-controls used in this project were all developed through the HWA Initiative. Monitoring data was submitted to regional databases supported by the HWA Initiative to enhance its usefulness in HWA management decision-making. 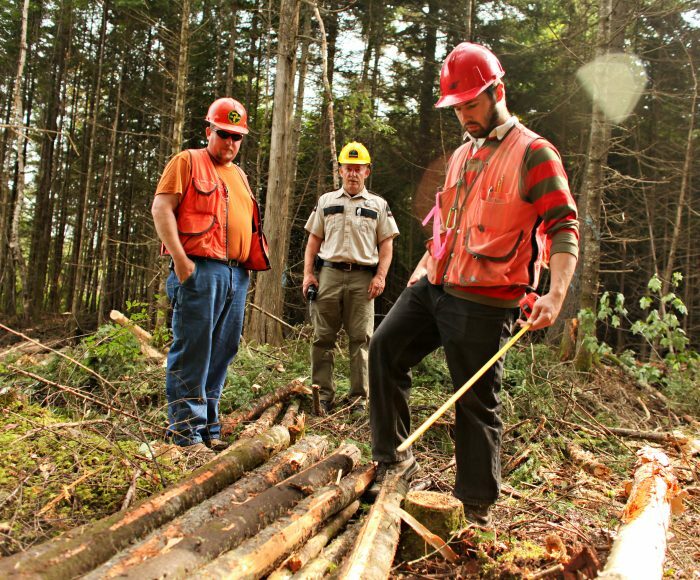 In FY14, Forest Health Protection provided support in designing and producing the 32-page hemlock management guide, as well as technical review. Monitoring data submitted to a database housed at Virginia Tech contributed to a report describing HWA winter mortality and recovery. With support from theUSDA Forest Service’s Forest Health Protection program, the Minnesota Department of Natural Resources’ Division of Forestry is achieving goals outlined in its Forest Action Plan. Minnesota’s invasive outreach campaign PlayCleanGo (PCG) is informing people and organizations about the best way to disrupt the spread of terrestrial invasive species. The invasive species outreach and prevention campaign received two, three-year competitive USDA Forest Service grants, one in 2008 to identify outreach needs through social research and one to launch in 2012 the branded campaign “PlayCleanGo: Stop Invasive Species In Your Tracks”. Since its launch, more than 130 public and private partners have adopted PCG as their invasive species outreach campaign with fun, accessible, consistent prevention messaging to disrupt the link between outdoor recreation and the spread of terrestrial invasive species. “The PlayCleanGo outreach campaign has greatly increased our ability to engage recreationists in prevention measures that protect our forests,” said Forrest Boe, State Forester. In three years, PCG has garnered 130 partner organizations including the North American Invasive Species Management Association. In two years of social media, PCG has created 12.8 million impressions, 147.8 thousand actions (clicks, likes or shares) and 12.5 thousand YouTube viewings. PCG has hosted two annual PlayCleanGo Days events at 13 park locations, three state fair events and booths at 12 sportsmen shows. At these events, volunteers speak to more than 20,000 visitors about the simple steps they can take to prevent the spread of invasive species in Minnesota and throughout the United States. Federal funds allowed the campaign to hire a marketing firm to guide the advertising campaign and paid for the development of PCG social media and print materials. With support from the Forest Health Protection program of the USDA Forest Service, the Mississippi Forestry Commission (MFC) is achieving goals outlined in its Forest Action Plan. Cogongrass is an invasive, non-native grass, which occurs in the southeastern United States. A pest in 73 countries and considered to be one of the “Top 10 Worst Weeds in the World”, cogongrass affects forest productivity, native species survival, wildlife habitat, recreation, native plants, fire behavior, site management costs to name a few. The Forest Health Protection program has enabled Mississippi to expand its efforts to combat its spread of cogongrass, which threatens the survival of the longleaf pine ecosystem. Most forest landowners are aware of the threats from cogongrass but often lack the financial resources to combat the plant. In 2009, Mississippi instituted a Cogongrass Suppression Program made possible by USDA Forest Service American Recovery and Reinvestment Act (ARRA) funding. The original ARRA program covered 19 of the 62 known infested Mississippi counties along the leading edge of the state’s Cogongrass infestation and ended in 2011. MFC has now conducted five successful cogongrass suppression seasons, serving 1,844 landowners and treating 27,268 spots of cogongrass. It also ran a public information campaign from 2010 to 2014 that included 27 public education presentations; 12 print and 12 radio PSAs; seven newspaper interviews; three radio interviews; four television interviews; and 21,000 copies of educational materials. The MFC cooperates closely on this project with various state and federal agencies and universities. “The Mississippi Forestry Commission appreciates our partnership with the USDA Forest Service. Our relationship is one that is truly working to help the citizens of our state by providing increased forest protection and improving forest health,” said Charlie Morgan, State Forester.